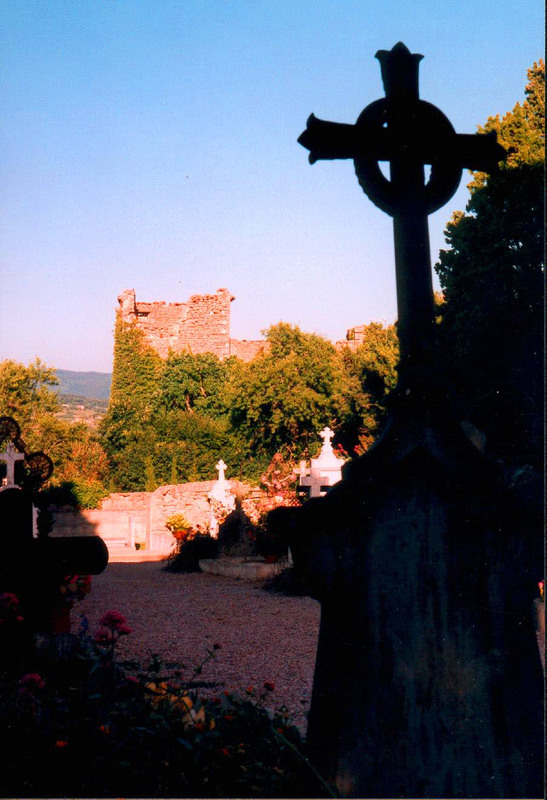 In those long-distant days when I used to visit Rennes-le-Chateau, casually with friends on a day out, it was a "must" to walk up and down the peaceful cemetary, to see the priest's grave at the top, with Marie Denarnaud's beside it - note the heart-shaped plaque on the left of the picture. I often used to stand before his grave wondering what secrets died with him, wondering what he would think of the cult tourist industry his village has now become. He would have liked playing the village squire, I should think. Then we would leave the grave behind us, to take photos of the church tower and the chateau over the graveyard wall, and go for lunch. Bérenger's grave in 2000, and the chateau seen from the graveyard. His grave was situated right up against the cemetary wall, on the other side of which was his domain. I had known for years the story that there was an underground chamber under the grave, extending under the wall, so that for a joke the priest could apparently pop up in two places at once. 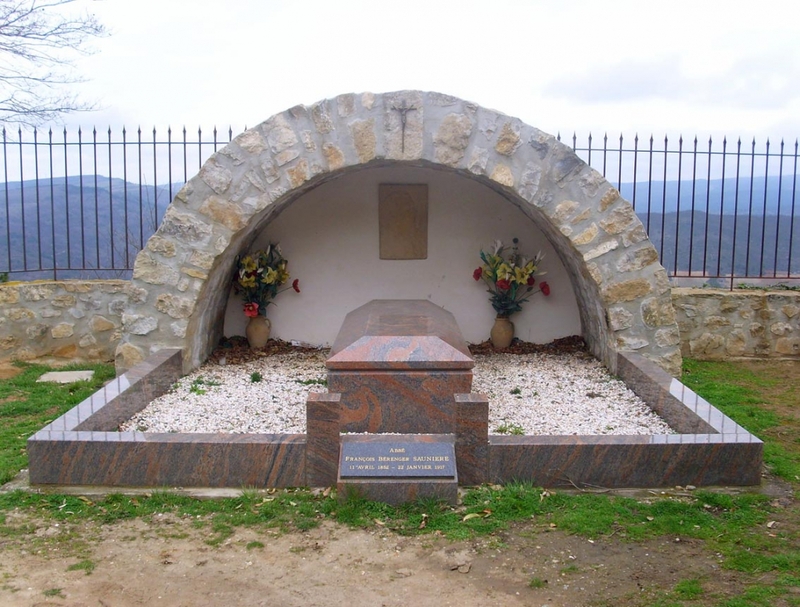 When I researched my book "Mary, Jesus and the Charismatic Priest" (click here to see it) I discovered that Sauniere had particularly chosen this spot for his grave, and I discovered his reasons, personal spiritual ones, for deciding on that definite place. He gave instructions that he was never to be moved. When we think of the day in his life, mentioned in many stories of his life, when he refused the villagers access to the cistern (or water-tank) on this domain it seems that he was hiding something in the vault. But what? Paradoxically, the new grave is over the site of this cistern. 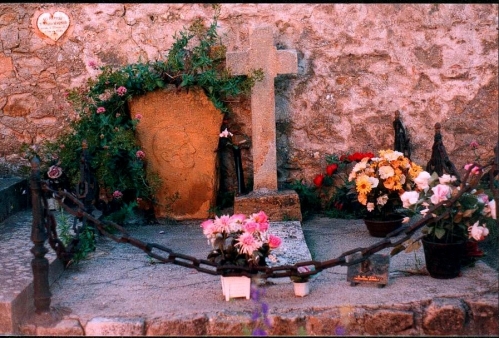 The picture above shows Berenger Sauniere's grave as I saw it in June 2000. Later that year, the Mairie (Town Hall) purchased the domain of Berenger Sauniere, that is, the Villa Bethania, the Tour Magdala, and the park with its belvedere walkway overlooking the valley. The presbytere, where is now the museum, was already owned by the Mairie. In 2000, when I took the above photo, I saw American tourists walking up and down the cemetary, straight across the graves of the dead, chattering at the tops of their voices. They had no respect for the dead at all. But worse has happened - at one time Berenger's grave was dynamited (around 1967) by people looking for treasure and quite recently the plaque of Marie Denarnaud's grave was stolen. The Mairie apparently received an urgent request from "the relatives of the Sauniere family" to move his grave to a safer place. I have seen graves renovated in other cemetaries; walls and railings were painted and new plaques affixed to walls; but people were not dug up and re-buried. But this is what the Mairie of Rennes-le-Château has done. In 2004, the municipality at Rennes-le-Château decided to move his grave and re-buried him within the park of the domain - not even in consecrated ground. This has all led to a lot of controversy within the village. It upsets me to think of people handling Berenger's actual remains - but they must have done. In Jean-Luc Robin's book, there's a picture of Sauniere holding a prayer-book. That prayer book was buried with him, apparently. But now it is hidden away in the Mairie. Apparently. The point is, what else is in the Mairie even though there is a municipal museum? While one understands that local Mairies don't want "researchers" knocking on their doors every five minutes, I must say I find it amazing how many local Mairies (I have researched other places) have suffered fires when things are all lost; who had everything taken away by the Germans during the occupation; or who have no archives available because they have gone away to be catalogued. They can hardly blame us for thinking they are hiding something, even if it's merely because they can't be bothered. The new grave can now be seen in what used to be Berenger Saunière's domaine. A legend has arisen, saying that, if you stand in front of the grave and ask Berenger Sauniere to grant you a wish, he will do it. My French friend Corinne says her mother tried it and swears it works. The point is, they believe his body is there. But where? In the strange red marble coffin on top of the grave? Or is that just an ornament? The cemetary is now permanently locked, open only for the Toussaint holiday (around 1st November.) One can only see Sauniere's new grave by buying a ticket to the museum, and sometimes it is insisted that you join a party on a guided tour. One cannot imagine concentrating one's thoughts on Bérenger Saunière while surrounded by a group of tourists, plus a guide talking about everything. Then - an article in the paper. Le maire de Rennes-le-Chateau, Alexandre Painco est assigne en diffamation par l'un des heritiers de l'abbe Sauniere. Un nouveau mystère entourant l'abbe Sauniere./ Photo DDM. Archives. Didier Donnat. The maire of Rennes-le-Chateau, Alexandre Painco, has been accused of defamation by the descendants of Berenger Sauniere. The centre of the controversy - his prayerbook taken from the mortal remains of the Cure in 2004. Feelings over Bérenger Saunière are by no means finished. The prayerbook of the Curé, 94 years after his death, continues to arouse passions. Today it's in the legal sphere that our curé is once again evoked - one of his descendants (through his brothers and sisters) has brought a court case. Today's maire, Alexandre Painco, would have been alerted by letter about the fact of the transfer of the mortal remains of the cure, from the communal cemetary to the mausoleum in the neighbouring domain, the 14 september 2004. At the time this transfer was made in secret and the gendarmes were alerted, and the current maire did not do it - he was elected in April 2008. The maire says the complainant wants back the prayerbook. This prayerbook is a symbol of the personality of the curé and the mystery that surrounds him. If it is not the key to the mystery, it could still set researchers on a new trail. But the affair is complicated by the fact that the municipal council voted for the construction of the mausoleum in 2003 in advance of a request for the transfer of the remains by the aforesaid descendant. Why was it all possible and in whose interests? 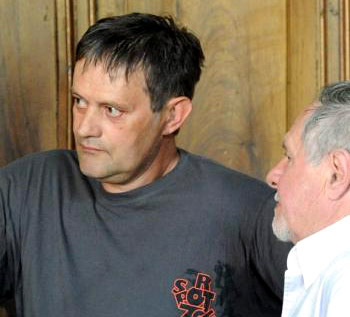 Alexandre Painco and his lawyer Jean-Marie Bourland are planning a counter-attack against the process to come. The lawyer believes the whole thing is a machination if not a manipulation. He has established the good faith of his client, he said strongly. A heavy task waits for the tribunal, who must lean towards establishing the existence of the prayer-book, then decide its restitution. 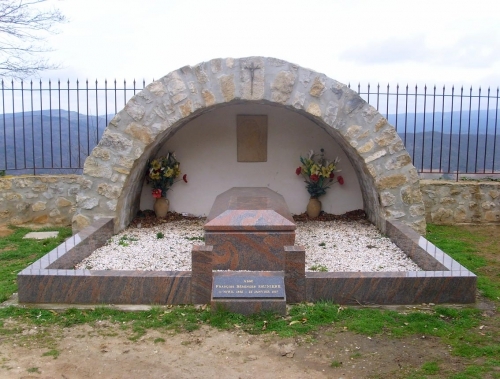 On the 14 September 2004 the remains of the Abbe Sauniere were transferred, in great secrecy, from the cemetary to the mausoleum, constructed in the old domain of the Abbé, now owned by the commune. The previous week the skull and crossbones over the cemetary gate was destroyed. People found it particularly interesting because the number of teeth was the magic number 22, the paper said. I found someone who had worked at the Mairie in that fateful year of 2004 and this person told me that; The Mairie received a letter from the family of Saunière, threatening that if the Mairie did not change the position of his grave, they would take his body away and put it in another graveyard - away from Rennes. They said that too many people had done a lot of damage to the graves and especially to Bérenger's. The Mairie were not happy about this; the tiny village only survives because of the story of Sauniere. So the body was removed and put 2 metres on the other side of the wall in a new and proper grave. There were other bodies in the old grave. This is hard to believe. All the books tell us that Sauniere himself specifically wanted his grave to be in that particular spot, and he bought the plot for himself in perpetuity. So who on earth - or in it - were the other bodies? My contact, who had been on the Municipal Council at the time, seemed to know very little - the grave is not a proper grave, it is on unconsecrated land for a start, and the decision to move it was taken before the relatives complained. The old people - added my contact in Rennes - whose loved ones and family are buried there were pleased that the cemetary was kept locked. Only the villagers, or the relatives of the villagers, can now enter the graveyard. I do not know anything about a missing prayer-book. But many items in the old museum were taken were taken by the family, saying they were legally theirs. Bérenger Saunière had especially chosen the site of his grave and booked and paid for it "in perpetuity." So I then spoke to someone who used to be the councillor-responsible-for-looking-after-the-graveyard in another village (miles away from Rennes) and asked; what is the specific meaning of the term "in perpetuity"? She told me; at the time Saunière booked his plot and paid for it, "in perpetuity" meant literally, for ever. All was paid in a lump sum and no relatives need ever pay the standard yearly fee towards the maintenance of the graveyard. (One senses Bérenger was thinking of Marie here - he had fallen out with his own family.) However, the law changed in the 1980's. Now "in perpetuity" can be defined as 15, 30 or 40 years, according to individual councils, or one can pay annually. It is surprising how many relatives stop paying the annual fee after a while, she added, and then the relatives must be found and permission granted to move or dispose of the body. She often had to track down missing relatives who didn't care to pay anything and never maintained the grave, or weeded it, or put flowers on it. However, if a grave was booked "in perpetuity" before the 1980's, then it remained "in perpetuity." That is the situation with Berenger's grave. But they moved it. If the relatives cannot be found, and it can be proved they cannot be found, then local Mairies have the right to remove and dispose of bodies so that the grave can be re-used. This sounds brutal but with an increasing population, space in graveyards is now at a premium. But relatives of Berenger Sauniere do exist, and one wonders how well they maintained his grave before the village became famous. However, if anyone wants to move a body, when all payments are in order, for any reason, special permission has to be applied for and given legally. My friend was also concerned that the new grave of Bérenger Saunière was NOT on consecrated ground. So am I. But all reports from Rennes-le-Château are that his relatives wanted the grave there - and if it wasn't moved from the graveyard they would take it elsewhere. My feelings are that Bérenger should be left to rest in peace. It seems incredible the Mairie would open his grave, and take the prayer-book with which he had been buried, out of his hands. In that case they must have opened the coffin in which he lay. Surely they wouldn't have done that? Gross! I tracked down the original reference to this prayer-book that I had read. It was in the translation by Henry Lincoln of the book by Jean-Luc Robin about "Rennes-le-Chateau and the secret of Sauniere." Another rumour; it's thought by some that Henry Lincoln and Jean-Luc Robin were great pals and neither of them liked the then mayor in 2004. So was there some chicanery going on here? Some in-fighting? Any errors in the translation of articles in the French papers are wholly mine. The prayerbook of Bérenger Saunière was the centre of proceedings yesterday in the police tribunal at Carcassonne. The fierce debate lasted for two hours. Alexandre Painco, the present mayor of Rennes le Chateau was summoned to answer the accusation of defamation by one of the inheritors of Berenger Sauniere, Jean Ribes, well-known to the people of Limoux and the great-nephew of the priest. The story began when Alexandre Painco, freshly elected in 2008, wanted to take up again the concession of the famous cure in the cemetary and wrote to the inheritors, that is Jean Ribes the plaintiff, and his family. ("Concession" is what people pay as a sort of rent of the grave. Berenger Sauniere's concession was for ever, but the municipality was it to be paid for.) In concluding his letter, M. Painco affirmed that during the transfer of the body the prayerbook of the priest would have been taken away from the body and put somewhere else. 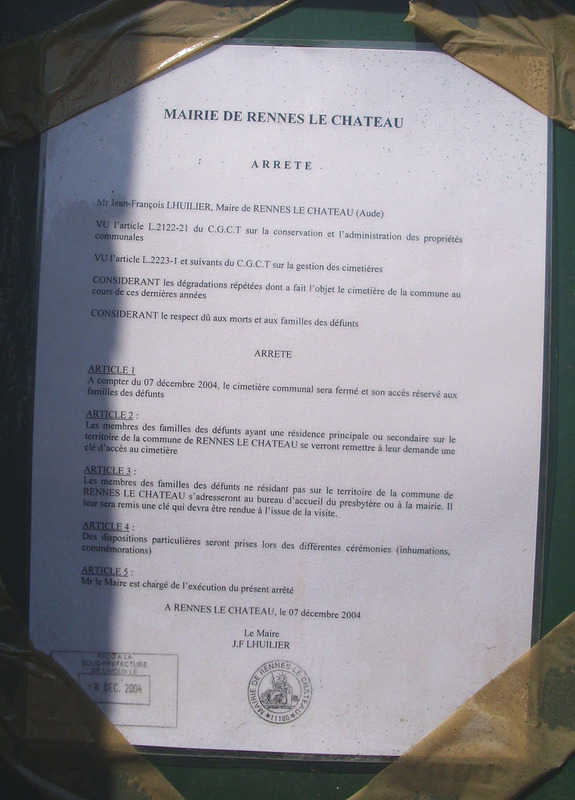 (The story in Rennes-le-Chateau is that it is still at the Mairie - Mayor's Office, or Town Hall.) This was what Jean Ribes found completely unacceptable. "If the mayor while he was at it had written a letter of apology, we would not be here," deplored the lawyer Jean-Louis Cirera. But more than the mention of the prayer-book, the defence and the civil parties were opposed to the conditions of exhumation. All was done legally, according to the lawyer of the plaintiff, citing as evidence at the bar the statement of the previous mayor, Jean-Francois Lhuillet, beaten in the elections of 2008. The new maire Alexandre Painco, defended himself during the hearing, claiming that this precious work, the prayerbook, was deposed in the new grave of the abbé. The lawyer Jean Louis Cirera for Jean Ribes, the great-nephew, retraced the facts point by point. A transfer was made on the 14th of September 2004 at seven in the morning "in the dawn light" in the presence of about 15 people, a moment which he solemnly described, when the famous body was taken away from the cemetery. The people included the sub-prefect of the time, M.Campariol, the local police chief from Limoux, the previous mayor M. Lhuillet and two adjuncts, several policemen, the employees of the funeral furniture company, and Maitre Cirera, the family lawyer for the closest relative of the priest, his great-nephew. "It was a strong emotional moment," says the Carcassonne lawyer, "In the coffin, there was the prayerbook of the priest, which was passed from hand to hand. A pious picture of the time was on the bookmark. Bones, the remains of clothes, shoes and prayerbook were then placed in the new grave." The remains of the famous priest, relatively well preserved, had been exhumed. The prayerbook was on Bérenger's chest, not between his hands. The lawyer for the defence of the mayor, Jean Marie Bourland metaphorically pushed up his sleeves, and retorted; "This whole thing has been orchestrated and schemed. They had all been in the wrong." He emphasised the fact that all the inheritors, 9 in total, were not present on that day when the body was exhumed. Now, before this trial of 14th September 2011, a geneaologist notaire found not two relatives but nine. The law insists that all relatives must agree to a new concession. Why was this action not done under Lhuillier? The lawyer was keen to prove that Alexandre Painco, had not studied the case and knew only what the people present there that day told him. An essential question was posed by the president of the tribunal at the beginning of the meeting; "Why, Monsieur Painco, did you write it in your letter?" (that is, that the prayerbook had been taken and a concession was demanded) to which there was no reply. The verdict will be given on the 17th November. The previous mayor might be asked to testify. He has already left a statement saying that; Faced with the degradation of the graveyard by "researchers" looking for treasure, and the group calling themselves The Solar Temple, when the Domaine of the priest came up for sale, the mayor did not hesitate and the commune paid the equivalent of 400,000 euros for it. The remains of the priest were transfered at the demand of Jean Ribes for the family lived in fear that Sauniere's grave would be profaned." It is a mystery to me why the previous mayor, who organised the exhumation, was not asked to testify in the first place. A few days later the papers said; There are the secrets that are heavy to carry. The relationship of Jean Ribes with the well-known Abbé Bérenger Saunière, would without any doubt have rested in the shade, if the circumstances of his presence at the tribunal had not been vital in his eyes to establish the truth. The action taken by the accused mayor of the time, Francois Lhuillet, lifting the prayerbook of the priest during the transfer of his remains from the cemetary to the new grave in the domaine, was not supportable. To steal from the right hand of the dead would be the same as to take it from the skeleton's chest. Jean Ribes' great-uncle was buried among sensational things in the cemetary, tombs were profaned, occult orders came there. Jean Ribes, for his family's sake, has lived for a long time in silence with this heavy pain. He never said anything about the quest for notoriety that became like a carnival. On his honour as a gentlemen, estimated by everyone and loved in his town of Limoux, the light of today's news has lifted a shadow. Bodies are usually buried in coffins. But the prayerbook was on Berenger Sauniere's chest. So they must have opened the coffin - and then transferred his remains, ("his prayerbook and his bones") presumably to another coffin. The whole idea of this fills me with revulsion. A French friend told me coffins, made of wood, do not last long underground and it would have decayed away. Did they pick up his bones by hand, or in a shovel then? The prayerbook had not decayed, nor its bookmark,but everything else had? A recent rumour is that they put all his bones in an ossuary. The great-nephew was not there but his lawyer was when this transfer took place. Had Sauniere's relatives been told his coffin was going to be opened? Did the Mairie (Town Hall) have the right to do this? First, to transfer his remains and secondly, to take the prayer book? The two court cases don't seem to have proved much. The verdict of the police tribunal was announced on the 17th November 2011. The mayor of Rennes-le-Chateau, Alexandre Painco, is not guilty of defamation. The demand for damages and costs from the great nephew of Saunière was not acceptable. The item in the paper reminded us that today's mayor had let it be said, in his letters to other descendants of Bérenger, that the prayer-book had been "recuperated" during the exhumation of his body in 2004. However, it appears the court believes that the prayer book was in fact, re-buried with him. There is no evidence for this. French justice is difficult to understand at the best of times. I don't suppose there will ever be an answer as to why Alexandre Painco was accused in the first place, if he wasn't there when the grave was moved. Yet he wrote that letter. . . the great-nephew, who had requested that Saunière's body was moved, didn't appear at the exhumation, but as soon as he heard about the prayer-book, which would be saleable for a high price in antiquity shops, he brought a case against Alexandre and demanded damages. Nobody is appearing in a very good light here, in spite of flowery words by lawyers. So all this has still not answered the question; was the Town Hall, the Mayor at the time, and presumably his council who agreed with him, correct to move Sauniere's grave? They could have simply kept the graveyard locked couldn't they? And why would concessions have to be paid for a grave in public, non-consecrated ground? The original payment was made by Bérenger in perpetuity. The police tribunal declared unacceptable the accusation of defamation made by the great-nephew of Berenger Sauniere against the mayor of Rennes-le-Chateau, Alexandre Painco. This last was accused of writing letters addressed to the inheritors of the abbe, saying the prayerbook was taken during the transfer of the remains of the priest from the cemetary to the new grave. If the judgement fully satisfies M. Painco, it raises in the conclusions several questions which grate, and the word is feeble, the right to respect the dead, inviolable in their graves, and the objects as well which were put with them. In effect, the verdict of the tribunal implies that "the fact that one seizes or takes possession of a lost or abandoned object is not known to constitute, in the absence of other accusations, a defamation." 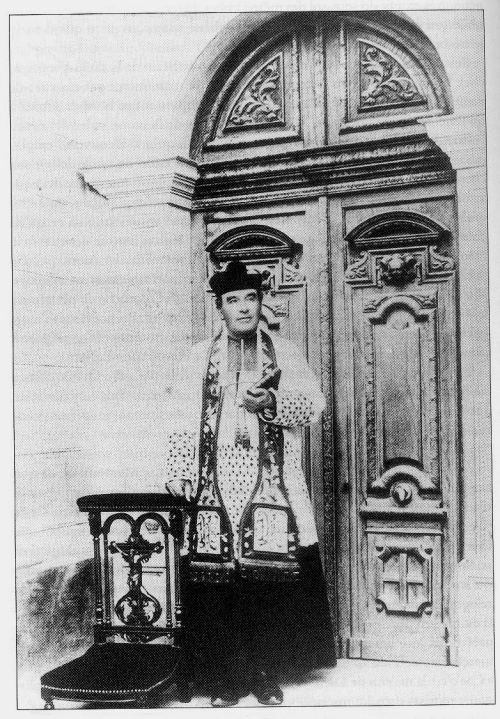 A prayer book, a rosary, a bit of jewelry, slipped into the coffin of the dead person before his or her ultimate voyage, must it be considered like a lost or abandoned object, that all the world can take, scorning the respect of the funeral rites and the offence made to the families? Must we conclude that all of the goods in tombs, damaged by bad weather or not, could be recuperated without risks of turning into a theft for the unscrupulous collectors, who think the things they find are their right? I too think it was faulty. It should have been against the previous mayor personally for a start. And it emphases there is such a thing as respect for the dead. I do not think Bérenger Saunière has received that. Photos show the notice on the gate and the maire in court with his advocat. The latest I have heard on the grapevine is that the current maire wants Bérenger's grave moved back. Since these events, a French association has been formed to find out more and to gain respect for the grave. ( Click here.) There is an English translate button and many photos. It tells us the grave in the Domaine is overgrown with weeds. The Mairie says it is the responsibility of the descendant to maintain it, said descendant says it is the responsibility of the Mairie. It is after all, their land. Reading between the lines, the court case cost the descendant so much money he cannot afford to maintain it and why should he pay the Mairie?